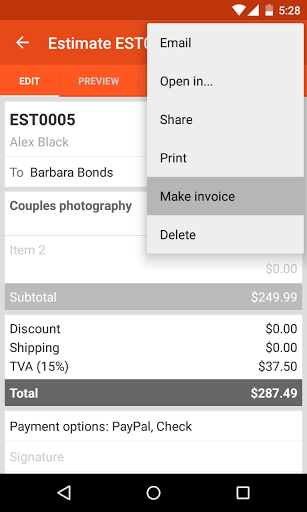 Invoice Simple is an easy and convenient invoice app to make and send invoices to your customers. • Invoices for products and services. • Create and send estimates to your customers, convert them to invoices later. • Customize invoice fields: quantity, rate, shipping and item number. • Invoice payment terms (eg 30 days, 14 days). • Discount on item or total. • Tax on item or total. • Tax inclusive or exclusive. • Customize company logo on your invoice templates. • Invoice # in letter and number. 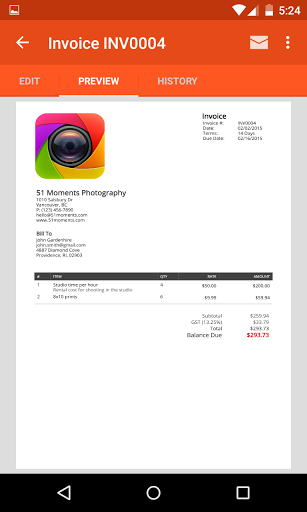 • Create invoices and estimates in PDF. • Sign your invoice or estimate. 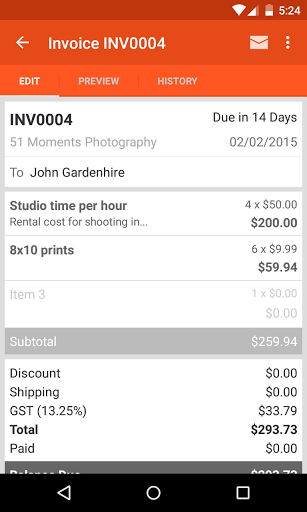 • Easily make invoices on your phone. • Built in PDF invoice generator right on phone for offline use. • Makes a great estimate app, for sending estimates to your customers to win jobs.